Arctic Char is a freshwater and saltwater fish commonly found in very cold waters. Being part of the salmon and trout family, it shares physical and flavor characteristics of both. Similar to salmon, arctic char also has an orange flesh; however, it is less fishy and a bit sweeter than salmon. 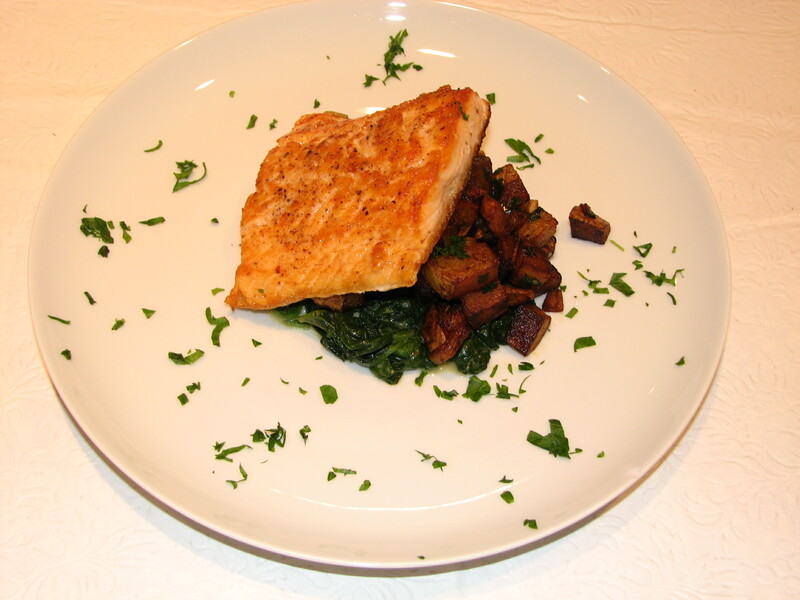 I prepared the Arctic Char with sautéed spinach and hash browns. The Arctic Char was purchased whole from Whole Foods, and was incredibly fresh. I knew the fish wouldn’t need much in the way of seasoning. Accordingly, I sprinkled the fish with some course salt and pepper and then pan seared it with olive oil. I finished the char under the broiler to allow it to cook all the way through and also create a crispy crust. The spinach was pan sautéed with garlic, and some Dijon mustard. The mustard really brought out the flavor of the baby spinach and helped accentuate the fish. To add a crunchy element to the dish I made some hash browns. I chopped Yukon gold potatoes into half-inch cubes. The Yukon gold potato have a more “waxy” texture than the more starchy Idaho potato, making it ideal for pan-frying. I sautéed the potatoes with olive oil until they were golden brown on all sides. About two minutes before the potatoes are completely cooked, I added sweet smoked paprika, salt, pepper, white onions, and parsley. All three components worked very nicely together and provided a nice variation of textures. I highly recommend Arctic Char to anyone who likes fish. It’s a nice alternative to Salmon, and if you don’t like salmon, then arctic char might be your calling. Enjoy.